Don’t Take My Middle Age Away! Huh? She’s in her late thirties, with small children, and she considers herself middle aged? I scrolled down to the comment section and discovered that lots of her readers are also in their thirties and consider themselves to be middle aged as well. One of them mentioned finding her first grey hair and deciding whether or not to pluck it out. I was dumbfounded. How can people in their mid or late thirties think they are middle aged? What in the world are they going to call themselves in TWENTY YEARS, when they are in their mid or late fifties? When they figure out that middle aged people don’t pluck out their grey hairs, because if they did, they’d be completely bald? More importantly, what would they call me, at the ripe old age of fifty-six? Remember when there was a popular television show called “Thirtysomething?” I do, but I don’t remember the characters being classified as middle aged. As I recall, they were supposed to be yuppies (which meant young, urban professionals) who were dealing with raising children, developing their careers, and struggling to maintain meaningful relationships. In short, they were coping with being adults, but there was no suggestion of them being middle aged. But if I had commented, I would have said something like this: “Don’t worry about being middle aged, because you’re not. People in their twenties are young adults. People in their thirties and early forties are simply adults. Middle age starts somewhere in the late forties and continues right up until the exact moment that I am ready to call myself a senior citizen. And that’s not happening any time soon. Very good! And very true. Thinking you’re middle aged in your 30’s or even 40’s is just wrong!! Hopefully not a sign of an ageist society and just the enthusiasm of the young to get on with things. At 50 I consider myself just starting my midlife fun or crisis depending on my mood. Yes, I remember when I was a teenager and thought that thirty was just ancient! But now, I think people in their thirties are so young. It’s all a matter of perspective, but I intend to hang on to my middle age as long as I can. Thanks so much for the comment! Please know regardless I don’t take any offense at all, and am actually genuinely curious about the accurate term for those on the cusp of the fourth decade. I think I was taking the term “middle age” literally, as in, at almost 40 I’m at the half-way point of an expected life (if 80s is the end game, though I’m hoping to break a 100). But I’m happy to put the title aside for another decade, or more! Actually, it was your blog! I changed the exact words of the quote a bit because I wasn’t sure if you wanted people to make the connection or not. But if you’re comfortable with it, go ahead and leave a link in the comment section, because it really was a good post! I’m glad you didn’t take offense, and I do understand where turning forty does feel like middle age. I remember when I defined it as between 40 and 60. But then I hit my mid-50s, and I thought that I needed to adjust those numbers just a bit. Mostly, I like your idea of “shucking” the age labels. (And shucking is, I think, an appropriate word here.) You are a great writer, and I’m very glad I found your blog, too!!! Hi Ann, isn’t the internet so funny! I was reading your post and was like, wait a minute, this all sounds so familiar 🙂 But I wasn’t offended at all and hope my wording wasn’t offensive to you or anyone else regarding what middle age means, exactly. Maybe I’m wrong, but I feel like in this age of social media saturation, we feel even more compelled to label ourselves, age included. Especially women. Like, how dare I consider myself youthful, even if in many ways I am, and feel that way, when society is like, oh you’re 40, that’s over the hill lady. And I despise how gender biased ageism is, so the absolute last thing I want to do is perpetuate it. That said, my heartfelt and genuine post is below, if anyone is interested in chiming in, I’d love to hear what you think. Thanks Ann! Looking forward to reading more of your words. Thanks for sharing the post, Dana! And I fixed the quote! 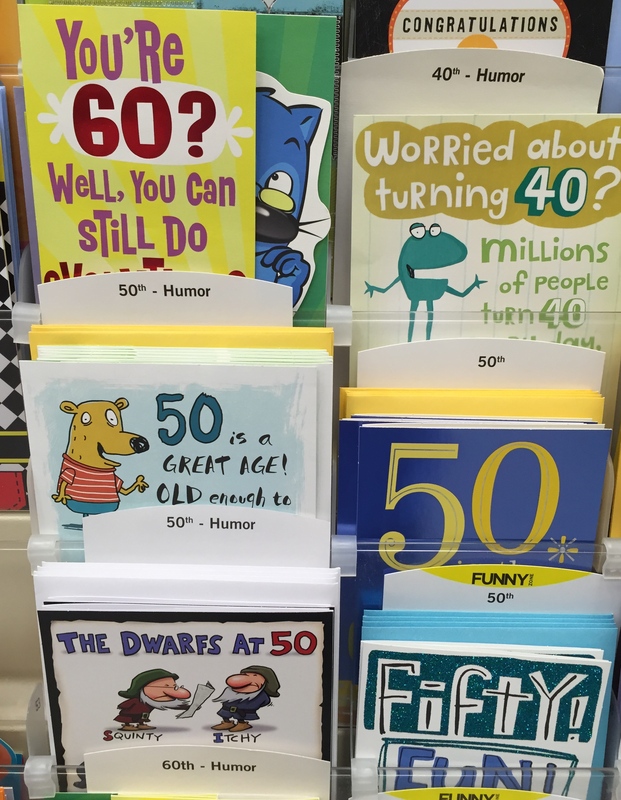 If 50 isn’t the new 30, then it darn well should be!! I like the way you think…. and fabulous. Let’s own it! Fifty and fabulous works for me!